Gates Foundation | Daniel Katz, Ph.D. It is March, and one of our nation’s historically great political parties is still on track to nominate a lying, bloviating vulgarian with authoritarian policy proposals, a penchant for re-tweeting quotes from Italian Fascist Benito Mussolini , and a reluctance to condemn the Ku Klux Klan. For many months, political pundits have consistently predicted his campaign’s demise, and his campaign has consistently refused to match their predictions. What has been truly astonishing has been the silence of the Republican donor class, a group of billionaires who have, until this race, been able to command the obsequiousness of politicians seeking the Republican nomination. The New York Times recently reported that as long ago as the last Fall, when Mr. Trump’s candidacy was showing far more staying power than was assumed possible, that an anti-Trump super PAC was proposed to help make the candidate unpalatable to voters – but not a single donor stepped forward. To be sure, getting caught in the line of Mr. Trump’s fire can be catastrophic for regular people. The Times also highlighted how Trump’s prolific use of Twitter focuses his ire on targets at all levels. Cheri Jacobus is a Republican strategist and contributor to a number of media outlets, and when she criticized Donald Trump for failing to participate in the last debate before Iowa, he unloaded on her – and was quickly followed by a swarm of his followers who relentlessly attacked her for days. In the same report, editor of The National Review, Rich Lowry, admitted that even the top Republican donors are afraid to take on Mr. Trump out of fear of his ability to send a tidal wave of negative publicity at them. It would appear that the donor class, by and large, are cowards. One thing that has held the Koch network back so far, in addition to the Trump backers within their ranks, is the concern that taking on Trump would inevitably draw the thin-skinned tycoon’s legendary invective, which it almost certainly would. If the Kochs go after Trump, rest assured that he will take every opportunity to highlight how he’s being attacked by a cabal of billionaires seeking to control the outcome of the election. And this more or less explains their caution to this point. By taking on Trump, the Kochs risk lending credence to his claims of being an outsider who is battling against a corrupt political system rigged by the elites. Does this sound familiar to supporters of public education today? It certainly should. While education reform has been played out in public, the financiers of those efforts have been less fond of the limelight on the whole. Dr. Diane Ravitch of New York University has frequently called them as “The Billionaire Boys Club” originally referring to the Bill and Melinda Gates Foundation, the Eli and Edith Broad Foundation, and the Walton Family Foundations whose efforts coincided over various aspects of education reform in the past 15 years. That “club” has many more members now, all working in various efforts to transform school via a combination of common standards and high stakes testing, breaking workplace protections for unionized teachers, and pushing for the expansion of school privatization via vouchers and charter schools. While some journalism has examined the role of big money in education reform, most of these “reformers” prefer to stay out of the spotlight, channeling money through foundations and 501(c) 3 groups, creating astroturf organizations to pose as teachers genuinely interested in corporate reform, buying politicians who force through laws and budgets favorable to their agenda, and hiring public spokespeople to launch splashy legal and web based campaigns to break teachers’ unions. CB:Yeah, we are raising money. This pattern is hardly isolated to Campbell Brown’s efforts either. While hedge fund manager Whitney Tilson is less shy than most about openly explaining his goals of influencing Democratic politicians to adopt privatization goals, his organization, “Democrats” for Education Reform funnels large sums of cash and influence from a variety of sources, mostly groups like the Walton Family Foundation. When education reform’s paid advocates found that they had trouble responding to public education supporters on social media, former Obama administration DOE official Peter Cunningham was simply granted $12 million dollars to found the “Education Post” to “create a better conversation” but also, in his own words, to create “the ability to swarm” on social media and to “hire” and “subsidize” bloggers. While Bill Gates is far more visible than most financiers of education reform, one of his biggest efforts to date was managing to organize 45 states and D.C. to adopt the Common Core State Standards without most parents or teachers realizing it was happening – by aiming almost entirely at power brokers and foundations in between election cycles. Wherever you turn in education reform today, you find a think tank, or 501(c)3, or astroturf group, or pseudo-media outlet being paid handsomely to create the public impression of organic support for reformers’ ideas. Direct and natural engagement with the public is not one of their stronger skill sets. Which loops back to Republican donors and their unwillingness to confront Donald Trump. On the one hand, it looks ridiculous that some of the nation’s wealthiest and most influential individuals are so afraid of negative public attention that they dithered for months, but on the other hand given how successfully they have influenced public policy without having to bother with actual democracy and given how bipartisan majorities of American voters already think the system is rigged in favor the ultra-wealthy, it makes sense that those most blatantly manipulating the system would hesitate to step out of the back rooms and into the public’s view. The good news for advocates of public education is that Trump’s level of ignorant bullying and outright vulgar bigotry is hardly necessary to make education reformers uneasy about scrutiny. For Campbell Brown, a few teachers and mothers with Sharpies rattled her ability to lie about teachers’ workplace protections on behalf of her donors. Peter Cunningham needed $12 million in foundation cash to pay bloggers to counter the efforts of working teachers with blogs and on social media who are defending their profession for free. The vast sums of money spent by Bill Gates to prop up and support the Common Core State Standards have not prevented dwindling support among parents and teachers as they grow more familiar with its impact on schools. Helping to keep light shining on how the donor class is pushing policy without the public’s consent goes hand in hand with the how harmful those policies have been. They’ve repeatedly shown that they dislike scrutiny. We have no reason to oblige them. Education Next is a reliable source of pro-education reform content. Published by Stanford University’s libertarian leaning Hoover Institution which “seeks to secure and safeguard peace, improve the human condition, and limit government intrusion into the lives of individuals,” the magazine/journal is also sponsored by Kennedy School of Government’s Program on Education Policy and Governance (affiliated with reliably pro-reform organizations like the Heritage Foundation, the Alliance for School Choice, Center for Education Reform, and the Heartland Institute) and the conservative Thomas B. Fordham Institute, dedicated to the premise that pretty much our entire education system is dysfunctional or dumbed down. Education Next blends characteristics of magazine publishing and peer reviewed journals in a quarterly publication that occasionally has tastes towards provocations that few purely academic journals would attempt. Michael Petrilli, the President of Fordham, is both a research fellow at Hoover and an editor at Education Next, and, by his own admission, loves “to mix it up” – which can put the publication in controversial spots even within the pro-reform community. For the Summer 2016 issue, the publication is not courting controversy so much as it is stating the obvious and begging the question. Editor-in-Chief and Henry Lee Shattuck Professor of Government at Harvard University Paul Peterson and Harvard post-doctoral candidates Samuel Barrows and Thomas Gift offer us the “good news” that in the wake of Common Core, states are setting “rigorous standards.” I say this with a degree of tongue-in-cheek because the article’s conclusion are fairly obvious – if you start with the premise that everything education reform has been saying for the past decade and a half is pretty much entirely true. Raise questions or complications to the exercise of standards, high stakes accountability testing, and their utility as policy levers and the entire exercise gets a lot less laudatory. Most states and the District of Columbia adopted the Common Core State Standards or some variation of the standards. To their credit, the authors do not avoid the major role of the Gates Foundation in financially supporting the CCSS and of the Obama administration in creating incentives for states to adopt the standards, and they provide some insight into the opposition to the standards from both liberal and conservative sides of the issue (although they greatly oversimplify liberal concerns to union politics – even though both major national teacher unions signed on the Common Core experiment). The authors also infer that if results from NCLB mandated annual proficiency examinations are close to state results on the National Assessment of Educational Progress (NAEP) then the state proficiency standard is as strict as the NAEP. The authors refer to their assessment of states as “truth in advertising” about how well states tell parents how their children are actually doing. This is another variation of the “honesty gap” argument that has was featured prominently by education reformers as states and communities got ready to receive the results of Common Core aligned testing. The authors admit that the opt out rates in some states may complicate these scores; to whatever degree students who refuse the tests would have been high scorers, this would artificially lower the percentage of students scoring proficient. Further, Massachusetts allowed districts to select between the state’s original MCAS exams or the new PARCC exams, but there is no way as of yet to know if higher performing districts kept the MCAS. The authors also observe that states’ standards performance has narrowed recently with 80% of state proficiency rates being within 15 points of their NAEP results. In other news: Water is wet. Dr. Peterson’s argument here is a little bit as if I took up alpaca ranching and then two years later praised myself for all of the timid, wooly, camelids on my property. Education Next may give states enormous credit for decreasing the percentage of students who are deemed proficient in their state tests and bringing those percentages closer to the results of the NAEP, but the desirability of this is unexamined as is why doing so raises a state in the authors’ estimation. This is no small question because it is hardly a given that a decrease in the gap between state exam proficiency percentages and those on NAEP indicates actual educational improvement or even that standards are actually “rigorous” as the Education Next headline claims. New Jersey, for example, scored very well in the authors’ rating with 2.1% fewer students ranked as proficient in state testing compared to the last NAEP. According to Education Next, New Jersey earned only a C in 2005 well before the Common Core State Standards, but research by Dr. Chris Tienken and Dr. Eunyoung Kim of Seton Hall University with Dr. Dario Sforza, Principal of Henry B. Pecton Regional High School, found that, using Webb’s Depth of Knowledge framework, New Jersey’s pre-Common Core Standards required more creative and strategic thinking in English Language Arts. New Jersey may have scored higher on Education Next’s metric, but the standards being used in K-12 English arguably demand less higher order thinking. Dr. Peterson and his associates also leave the desirability of getting state proficiency levels closer to NAEP’s entirely unexamined and simply assume that it is a good thing. This, too, is no small question because the NAEP’s proficiency targets are deliberately set very high. Dr. Diane Ravitch of New York University sat on the NAEP Board of Governors for seven years and explains here that proficient and highly proficient in the NAEP are pegged to very high level work in the A range for most students. Further, she explains here that this was done deliberately because Dr. Chester Finn, who chaired the NAEP Board, is not impressed with the quality of American education in general and wanted the proficiency levels in NAEP to reflect that. The PARCC consortium consulted NAEP heavily in the creation of its test while SBAC used far less from the NAEP, but as of last May, SBAC did not expect scores to vary that much from the national program. Even outside the consortia, states looked very deliberately to decrease the number of students labeled proficient. New York State linked its proficiency levels to performance on the test that an ETS study said was predictive of SAT scores only a third of students obtain; lo and behold, the number of students labeled proficient dropped to about a third. This was also roughly the same as New York’s eighth grade NAEP English results which have been 33% or 35% at proficient or above since 2003. Just for good measure, 33.2% of New Yorkers over the age of 25 have a Bachelor’s degree or higher. None of this, however, changes a simple fact: the setting of cut scores for different levels of proficiency is a choice independent of how the scale scores from the exams are distributed. New Jersey teacher, Rutgers graduate student, and blogger Jersey Jazzman deftly explains that even when New York set its cut scores to a very high level, the distribution of scale scores on the state exam barely moved, and that is because the decision to place cut scores is independent of how students do on the test itself and of how schools and districts and states compare to each other. Gaps between subgroups and communities still exist and students’ performance on the test itself remains largely unchanged whether “proficient” is set to capture 60% of all test takes or 30%. It should be noted that based on the authors’ descriptions, a state could probably have changed nothing about their standards or their accountability exam, set their cut scores to label fewer kids as proficient, and gotten a high grade in their report. Left undiscussed is whether or not this is remotely desirable for a state system of accountability testing. If “proficient” and “highly proficient” are achievement labels that should be reserved for students likely to go to a four year college or university, then education reform advocates have never effectively made that case to the public, preferring instead to point to the results on state testing that have been designed with this specific result in mind and declaring themselves correct about how poor a job our nation’s schools are doing. On the other hand, even if these cut score level are correct, what is the argument that we need vastly more children scoring at these levels? I’ve argued repeatedly on these pages that there is little economic evidence that the nation’s economy is in need of more Bachelor’s degrees and that the inability of people to get ahead with a college education or to live above a subsistence level without one is a much greater crisis needing vastly more widespread action than can be achieved by schools alone. While it is absolutely true that educational opportunity, like economic opportunity, is unequally distributed by race and class, the solutions for that are not going to be found by rigging cut scores but rather by substantially addressing something education reformers today generally discount: inequitable and inadequate school funding. Barring substantial shifts in the political landscape, both houses of Congress are expected to vote on the re-authorization of the Elementary and Secondary Education Act which has just come out of the conference committee. If passed in both the House and the Senate, the bill, dubbed the Every Student Succeeds Act, is expected to be signed into law by President Obama before the end of the year. This will officially usher us into the post No Child Left Behind era, and, as is typical with legislation nowadays, there is something in the final product to frustrate and worry pretty much everyone. While ESSA represents tangible improvements over the widely hated NCLB, there are worrisome elements in it and a great deal of larger and more fundamental aspects are handed over to the states where we can probably expect prolonged fights over implementation. Nineteenth Century lawyer-poet John Godfrey Saxe noted, “Laws, like sausages, cease to inspire respect in proportion as we know how they are made.” He probably had something like the agonizing and lengthy wrangling over rewriting the Elementary and Secondary Education Act in mind when he said it, especially this final stretch when lawmakers will vote on a 1000 page long conference bill they have not read thoroughly. And, indeed, it seems some choice bits got chopped up and inserted into this final version, notably a chance for private financial interests to make money on public education dollars. Consider language for Title I, Part D for prevention and intervention programs for children and youth who are neglected, delinquent, and at risk, section 1424 allowing funds to go to “pay for success initiatives,” and similar language in Title IV, Part A. ESSA defines a “pay for success initiative” as a “performance-based grant, contract, or cooperative agreement awarded by a public entity in which a commitment is made to pay for improved outcomes that result in social benefit and direct cost savings or cost avoidance to the public sector.” The gist is that private entities can put up money as a loan for a public program and if they save money in the process of being more effective or more efficient than the public sector, they can keep a portion of the money saved. This is the kind of creative use of private philanthropy and financing that is supposed to incentivize deep pocketed entities to do good – and end up doing right well in the process. Goldman Sachs experimented with the model in Utah by financing preschool for 595 additional children in a well regarded program, 110 of whom were expected to need special education services. After a year in the Goldman sponsored intervention, only 1 student entering Kindergarten was found to need those services, and the financial giant will now be paid $2500 per pupil per grade without special education services until students reach sixth grade when the amount of money will go down. That’ll come to $1.9 million dollars on top of the original money loaned and paid back. Fred Klonsky, a retired Chicago teacher and current blogger, is highly skeptical both of the payments back to Goldman and of the claim that 109 students out of 110 were no longer in need of special education services after a year in preschool. I have to admit that I share that skepticism and certainly think that social impact bond financing allowed in ESSA will require very vigilant monitoring to make certain outfits like Goldman Sachs are not creating perverse incentives to simply overlook a need and “save” money. They are a largely unproven vehicle for creating social change, although some are organized to minimize risk for private capital while giving them a lucrative upside. It isn’t hard to imagine who lobbied to get that language inserted into the Title I and Title IV changes then. For that matter, as Mercedes Schneider notes in her first assessment of the bill, charter schools get a big, wet kiss, and there are grants that read as friendly to Teach for America’s role in “teacher preparation”. That said, there are many changes to the current education landscape contained in ESSA, many of them positive. The Badass Teachers Association has a solid look of the good and the far less than good in the bill. On the troubling side, ESL students are potentially labeled using very crude means, encouragement of merit pay, misplaced confidence in adaptive assessments and misgivings that “individualized instruction” will lead to more time in front of screens rather than with teachers, and, of greatest concern, continuation of NCLB’s requirement of annual testing of every child each year between grades 3 and 8 and once in high school and it caps alternate assessments for disabled students. However, ESSA spins much more authority for accountability and assessments to the states, includes mechanisms to improve teacher workplace conditions, prohibits the federal DOE from interfering in state laws regarding parents opting children out of state assessments, and there are positive developments for homeless children, impact aid, Native American education, state innovation and local flexibility. No officer or employee of the Federal Government shall, through grants, contracts, or other cooperative agreements, mandate, direct, or control a State, local educational agency, or school’s specific instructional content, academic standards and assessments, curricula, or program of instruction developed and implemented to meet the requirements of this Act (including any requirement, direction, or mandate to adopt the Common Core State Standards developed under the Common Core State Standards Initiative, any other academic standards common to a significant number of States, or any assessment, instructional content, or curriculum aligned to such standards), nor shall anything in this Act be construed to authorize such officer or employee to do so. I believe that when historians write the story of the Test and Punish Era of public school reform, this language will be noted as the “Take A Seat, Arne” Act of 2015. Education Week noted a week ago that “accountability hawks” were already unhappy with the information coming out of the conference committee. Sandy Kress, an original designer of NCLB, worried that states were going to be allowed to create accountability systems not based on student learning. Chad Aldeman, a partner at Bellweather Education Partners, worries that states will give in to inertia and not push for improvements for their most at risk students. Meanwhile, the National Association of Secondary Schools Principals applauded the available framework, noting the removal of Annual Yearly Progress (AYP) requirements and “unworkable” school turnaround models. The National Governors Association announced full approval for the conference bill, saying that it “restored the balance” between Washington, D.C. and the states. So – is NCLB well and truly dead? While some of the worst provisions of NCLB have finally had a stake driven into their hearts, the states are still required to test and the create accountability systems, so the upshot is that making sure both those tests and the systems are fair and based upon what schools and children need will now have to be done state by state. Monty Neill of FairTest notes that this will not be a simple matter: States still have to rank schools largely on test scores, there is ambiguity on how “additional indicators” for English Language Learners will be weighted compared to test scores, states have to identify the bottom 5% of schools based on test scores and intervene with measures designed by the state. In other words: whether or not schools find themselves under a test and punish regime or in a monitoring and support system will largely depend upon how states treat their newly reclaimed authority. There is no reason to believe that the advocates of test and punish will pack up shop now that the Secretary of Education has been severely limited. After all, federal help was useful for the spread of the Common Core State Standards, the testing consortia, and the adoption of growth measures in teacher evaluation, but it was hardly to only entity to help. Both the National Governors Association and the National Council of Chief State School Officers were on board with the Common Core State Standards and the shared assessments. The Gates Foundation is certainly active in state and local education policy, using grants and other leverage to push through favored policies. Powerful private interests have financial stakes in declaring public schools failures and turning them over to private management. They give lavishly to their allies in state government. Think about governors like Andrew Cuomo of New York, Dannel Malloy of Connecticut, Chris Christie of New Jersey, and Scott Walker of Wisconsin – advocates of our fully public schools have our work cut out for us. So – roll up your sleeves wherever you live and work. This has only just started. Who Was The Last “Education President”? I want to be the education President, because I want to see us do better. We’re putting more money per child into education, and we are not performing as we should. […] And I would like to urge the school superintendents and the others around the country to stand up now and keep us moving forward on a path towards real excellence. Eventually, the Republican nominee would become President George H.W. Bush, and his education agenda was a continuation of the path forged under Ronald Reagan that led to the era of test-based accountability. Presidents and Presidential aspirants have all set their sights on making an impact on our nation’s education system, whether it was Bill Clinton calling for 90% graduation rates and “meaningful” national examination standards, or George W. Bush claiming standardized test scores were stagnant and promoting new accountability for teachers and students – including a system of rewards and punishments that would become known as No Child Left Behind, or Barack Obama promising more aid to the neediest schools, touting merit pay plans, and decrying too much focus on testing. But who was the most recent occupant of the Oval Office who deserves the title “The Education President”? When was the last time an American President signed into law an education bill that has had a substantial, sustained, and positive impact upon education? This is not sarcasm because it was President Gerald Ford who, on November 29th, 1975, signed PL94-142, also known as the Education for All Handicapped Children Act, into law. President Ford issued a signing statement expressing his concern that the law would cost too much, but over its 40 year history and re-authorization as the Individuals with Disabilities in Education Act (IDEA), the legislation has improved educational opportunities and outcomes for millions upon millions of students who had previously faced neglect and discrimination within school. While the law continuously needs reflection and improvement, especially in the realm of federal funding which has never approached the 40% promised by Congress in 1975, the legislation remains a landmark that provides the basis for a vastly expanded mission for our nation’s schools and progress towards fulfilling opportunity for all. President Lyndon Johnson, following the landmark Civil Rights Act, signed the Elementary and Secondary Education Act (ESEA) into law on April 11th, 1965. The original law provided federal funds for research, strengthening state departments of education, and, perhaps most importantly, funding to assist the schooling of low income students, and among its earliest amendments were provisions for handicapped children and bilingual education programs. The Title I provisions, especially, noted the inequitable ways in which schools are funded using property tax revenues that immediately place communities with high percentages of low income families at a disadvantage. Although the ESEA has since been subsumed by the standardized test based accountability regime of the 2001 amendments known as No Child Left Behind, the original legislation was intended to help with President Johnson’s “War on Poverty” by bringing resources that only the federal government could leverage to schools serving our neediest children. Indeed, that focus upon using federal reach and the enforcement of civil rights to expand resources available to schools while requiring them not to discriminate upon race, gender, language spoken, or disability status marked a robust period of education legislation premised upon equity and the recognition that certain populations of students were historically marginalized and required direct action of the law aimed at states and municipalities that might have otherwise ignored them. In many regards, these efforts were astonishingly successful. In 1971, before the passage of Title IX, women were 3.7 million of 8.9 million college students. In 1991, they were 7.7 million of 14.1 million. Before the passage of PL94-142, 5.9% of students in public schools were identified as disabled with no data available on the numbers with specific learning disabilities. In 1989, 11.4% of students were identified as disabled, including more than 2 million classified with specific learning disabilities. These efforts were substantive, aimed at increasing access and equity, and their positive benefits have continued for decades and likely more to come. Since then? Not so much. If an unfriendly foreign power had attempted to impose on America the mediocre educational performance that exists today, we might well have viewed it as an act of war. As it stands, we have allowed this to happen to ourselves. We have even squandered the gains in student achievement made in the wake of the Sputnik challenge. Moreover, we have dismantled essential support systems which helped make those gains possible. We have, in effect, been committing an act of unthinking, unilateral educational disarmament. Our society and its educational institutions seem to have lost sight of the basic purposes of schooling, and of the high expectations and disciplined effort needed to attain them. This report, the result of 18 months of study, seeks to generate reform of our educational system in fundamental ways and to renew the Nation’s commitment to schools and colleges of high quality throughout the length and breadth of our land. The Reagan Administration followed in 1988 with amendments to the ESEA requiring states to “document and define” academic achievement for disadvantaged students using standardized test score measures, and ESEA funds began being tied to academic performance of disadvantaged children. President George H.W. Bush proposed his “America 2000” legislation calling for national standards and testing of students but which failed due to conservative opposition in the Senate. Standards based education policies were similarly advanced, however, by President Bill Clinton whose “Goals 2000” agenda focused upon student achievement, tougher academic standards, application of those standards to all students, and monitoring reform efforts via standardized testing. The stage, then, was well set by three previous administrations for the 2001 re-authorization of the ESEA which was touted as “No Child Left Behind” by President George W. Bush. NCLB required all schools to demonstrate annual yearly progress for all students in all subgroups, and failure to meet AYP for five years in row could result in school closures, turning schools over to private charter operators, or giving school operation to private or state managers. Upon passage, the law enjoyed support in both parties and numerous civil rights organizations, and the logic of that is not difficult to understand. By 2001, wide gulfs in test measured achievement remained stubbornly persistent between well off, mostly white, suburban communities and their poor, most African American and Hispanic, urban counterparts, and the language of NCLB demanded that states and municipalities address that through accountability systems with little wiggle room. Given the undeniable need for federal action in both civil rights and expansion of educational equity in the 1960s and 1970s, the federal accountability in NCLB was a logical, if ill-fated, marriage of federal standards and accountability efforts with vigorous enforcement from Washington. In contrast, since the advent of No Child Left Behind (NCLB), with its high stakes for schools, the traditional pattern of time allocation across subjects in elementary schools has changed markedly. Five years into NCLB, researchers found that 62 percent of a nationally representative sample of all districts in the United States—and 75 percent of districts with at least one school identified as needing improvement—increased the amount of time spent on language arts and math in elementary schools. These increases were substantial: a 47 percent increase in language arts and a 37 percent increase in math. Correspondingly, these districts decreased time allotted to other subjects and activities, including science, social studies, art, music, physical education, and recess (McMurrer, 2007). In reality, the administration of President Barack Obama, while loosening some of the proficiency targets of NCLB, has plainly made the most problematic aspects of the law even worse, and quite likely earning President Obama the label as the worst President for education policy in the post-World War II era. 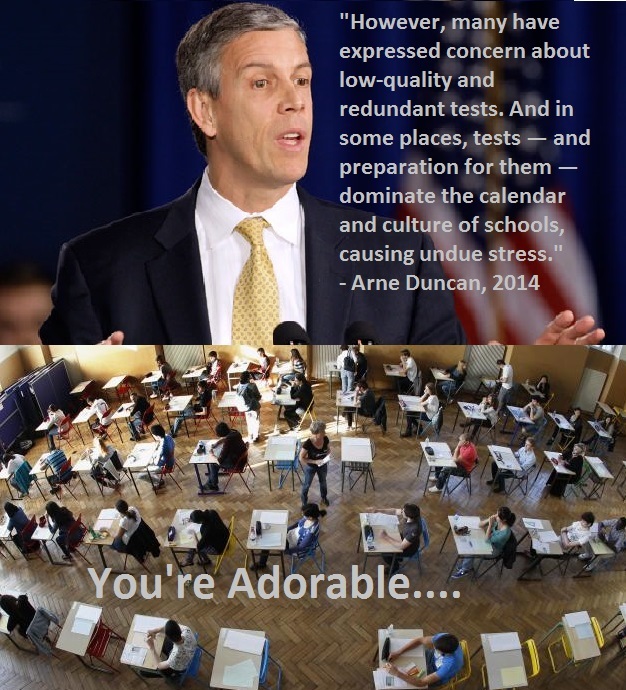 President Obama, acting through Secretary of Education Arne Duncan, has made testing an even bigger focus of school by coercing states to adopt invalid and unproven measures of teacher performance using standardized tests. Instead of merely working in a school that faces negative consequences based on test scores, teachers themselves face career sanctions if they do not “adequately” raise student test scores. President Obama’s Department of Education has lavished money and favorable policies upon the charter school sector while thoroughly failing to oversee the money it has dispersed. The administration was so interested in fulfilling the long held goal of national standards, that it helped the Gates Foundation push through rushed and unproven standards to almost all states by using the promise of federal grants and waivers from NCLB provisions. These changes have been touted as voluntary and “state led,” but when Washington state did not pass legislation tying teacher evaluations to student growth measures, the Obama DOE brought down the hammer and revoked its waiver. Today, 32 years after the beginning of the standards and accountability movement, 14 years into the test and punish era of school accountability, and almost 7 years into the Obama administration’s doubling down on standardized testing to measure teachers, teacher morale is at all time lows and the nation’s teacher preparation programs are struggling to find candidates. Far from continuing the vital work of expanded opportunity and equity that spanned administrations from President Eisenhower’s use of federal troops to desegregate Central High School in Little Rock, Arkansas to President Ford’s signing of PL94-142, the past five administrations have slowly tightened the grip of standardized testing on our schools until they have become a warped goal in and of themselves and have damaged the very children supposedly helped by them. Standardized tests used to sort children have always disproportionately harmed poor children and children of color, and the frequent, high-stakes, accountability testing of NCLB has both narrowed the curriculum and slowed progress in closing the achievement gap, progress that saw its most sustained and dramatic gains in the 1970s. We won’t have a President who deserves the title “The Education President” until we once again have a public servant in the Oval Office who sets equity of access and equity of resources as primary goals of federal education policy. Five administrations ignoring the lessons of history and the evidence of research is enough. When current U.S. Secretary of Education Arne Duncan announced that he would step down at the end of this calendar year, President Obama immediately stated that current deputy secretary and former Commissioner of the New York State Education Department, Dr. John B. King, Jr. would replace him in January. Supporters of the Secretary designee took to Twitter with #ISupportJohnKing, touting his personal biography and what they called his lifelong experience in education. It is undeniable that Dr. King has an immensely impressive, even inspirational, biography. Orphaned at a young age, the future Secretary of Education credits New York City school teachers with “saving” him, and he has built upon his obviously prodigious academic talents to earn degree credentials second to none. After a short stint teaching, he co-founded the Roxbury Prep charter school in Boston before helping to lead the Uncommon Schools network of no-excuses charter schools. He was tapped in 2009 to become the assistant commissioner of education at NYSED, and in 2011, he was elevated to the Commissioner’s office at the age of 36. It is without question, that he is a man of enormous drive and intelligence, and, as his supporters say, he has extensive experience in the field of education. But what if it is totally the wrong experience? This is not an idle question because while public education advocates often note how frequently major proponents of reform have no practical experience in education before being elevated to positions of influence and authority, all experience is not equivalent, and there is plenty of evidence that Dr. King’s experience in education leaves him ill prepared for the political exigencies of educational leadership outside of the no-excuses charter sector. In fact, the first time in his long career in education that Dr. King was truly answerable to political and parental constituencies was when he was elevated to lead the NYSED, and it was a disaster. While informed and dogged in pursuit of the policies which landed him his office, he demonstrated no legitimate understanding that he was leader of a system of education that depended upon support from lawmakers, parents, and the body politic in general. Policies on the Common Core State Standards and associated testing were both disruptive and demanding with little effort to help teachers and families adjust, and promises to listen to what educators were saying about policies went unfulfilled. Public meetings where parents voiced their opinions on new state policies did not go well, forcing him to cancel scheduled meetings and change the format to decrease his contact with constituents. Lawmakers similarly found Dr. King unresponsive to their concerns, leading to a rare display of bipartisan sentiment in Albany as legislators called for his removal. While I know many critics of education reform in general and of John King in particular who have a wide range of opinions on why his tenure at NYSED was as stormy as his public affect was passive, the simplest explanation that I can see is that there is nothing in Dr. King’s experience that remotely prepared him for the responsiveness needed in our fully public school system. When he took the Commissioner’s office at NYSED, that was the first time in his entire career in various sectors of education where he was accountable to the political constituencies that have voice in public education policy and practice. Consider his role as a charter school leader. While the charter school sector is publicly funded, it is not remotely fully publicly accountable. Some charter operators are exceptionally aggressive in defending themselves from public oversight, but all of them are deliberately separated from the democratic processes that oversee the funding and operation of our fully public schools. A school principal is a an educational leader and a political figure with constituencies among elected officials, taxpayers, parents of children in the school, the children themselves, and teachers. Public school superintendents are similarly situated although at a higher level than school principals. Charter school operators excuse themselves from much of that, periodically subjecting themselves to review by their authorizing bodies, but otherwise functioning not only outside of local, elected accountability systems, but often excusing themselves from following education law – and gaining support from the courts to do so. Even in responsiveness to parents, charters are not particularly obligated to be especially deferential. The “no excuses” sector of charter schools in particular tends to place heavy demands upon parents and vigorously enforces narrow behavioral norms on children as young as five years old. Since charter schools are schools of choice, the response to any parent concerned over disciplinary or academic practices can be limited to “maybe this isn’t the school for you” or other means to counsel out families. The Uncommon School Network that Dr. King led before joining NYSED is an exemplar in this respect with Roxbury Prep inflicting a 40% out of school suspension rate upon its students in 2013-2014 (which, sadly, is an improvement on a the previous school year’s 60% out of school suspension rate). This pattern is typical among the entire Uncommon Schools network which have much higher suspension rates than their neighboring schools in the three state where they operate. And since there is no political authority to which charter schools need to answer and since parents who dislike these policies do not have to be considered, it is hardly surprising that many such school demonstrate stunning cohort attrition rates, such as North Star Academy, an Uncommon affiliate in Newark, New Jersey, where only 25% of African American boys who enroll in 5th grade are likely to make it to 12th. So I asked him, “Are you preparing these kids to be leaders or followers? Because leaders get to talk in the hall. They get to talk over lunch, they get to go to the bathroom, and people can trust them. They don’t need surveillance and police officers in the bathroom.” And he looked at me like I was talking Latin, because his mindset is that these children couldn’t do that. It is unlikely that there is a competent principal or superintendent of schools in the country who would be surprised to face questions about methods and policies, but Dr. Noguera’s recounting demonstrates the extreme limitations of John King’s experiences. His extreme focus and concentration upon executing an agreed upon set of priorities are traits that serve executives well in the business world (although even there an ability to pause, evaluate, and change direction are necessary), but in our fully public schools that focus has to be tempered by full awareness of and a degree of deference to the overlapping and sometimes in conflict constituencies that oversee, fund, and participate in our schools. This is trickier than most expect. A typical school district looks like a highly integrated, top down system of management that is mostly analogous to a corporate structure. You have an elected school board (corporate board elected by shareholders) that hires a superintendent of schools (CEO) who is then responsible for hiring various central office administrators (corporate vice presidents and other chief officers) and school administrators (upper and management) who in turn hire and manage classroom teachers (customer contact personnel). From the outside it looks very neat and corporate with an easy flow of directives from the top of the organization all the way down to the classroom, but the reality is far more complicated than that and of necessity. When Karl Weick analyzed the concept of “loosely coupled systems” he used educational organizations as a clear exemplar precisely because tight top down control is not truly compatible with how schools and school systems work, which actually lends a number of clear advantages to the system. Within the loosely coupled system, different elements of the organization are connected to each other, but each retains significant individual identity and may only influence the behavior of the others indirectly. Of the different types of associations in the system, the primary is the designation of the formal organization’s participants according to role and status…..
A second type of association in the personal but purposeful relations among those with formal designation and within the formal system….Each chapter in this book reveals participants deciding how they will behave and seeking out colleagues inside the organization with whom to act out their decisions. The formal organization is filled with these personal and purposeful associations, too numerous to be formally recognized, which operate inside and drive the organization. The third type of association consists of those that join people inside with people outside the schools. The system is replete with freestanding, single purpose associations that include parents, students, policymakers, critics, change agents, teachers, and administrators, combining their efforts to achieve some end. These are the most interesting, because they reveal the breadth of the system and thereby justify the assertion that the system extends far beyond the schools…. To be certain, such associations have not always protected students’ interests, especially students in the Jim Crow era where local “interests” maintained White Supremacism, but powerful associations of advocates for children of color, for students with disabilities, for gender equality, and for LGBT students have used these same mechanisms to influence change at every level of the system. The weakness of Dr. King and of many of today’s reform advocates in understanding and navigating these systems should be apparent, and their general surprise at the backlashes they have faced further indicates their lack of understanding of the how the system operates. Bill Gates himself openly admitted “The cities where our foundation has put the most money is where there is a single person responsible. In New York, Chicago and Washington, DC, the mayor has the responsibility for the school system.” That may have been expedient in pushing his favored reforms from the top into schools, but it has pretty well failed to win over lawmakers, teachers, and parent constituencies who still operate within a system that provides them with the means to influence the direction of policy and have a say in outcomes. Gates is occasionally able to admit that he was mistaken in an area he intended to reform, but he seems oddly incapable of grappling with why those efforts founder. It seems evident that he has spent precious little time trying to actually understand how public education functions at either the organization or system level. Similarly, reform advocates who get Gates support, such as John King, often have extremely limited experience with the majority of the education system and seem absolutely flustered when it does not respond like the tightly controlled systems they prefer. This does not mean, of course, that people with extensive experience in the education system will reject the reforms embraced by Gates and his beneficiaries. Dr. King’s successor in New York State is Commissioner MaryEllen Elia, and she has precisely the kind of biography that would teach one how to operate a statewide school system – and she is as dedicated to common standards and mass standardized testing as anyone in the country. That’s a talent set that seems in short supply on the reform side of the debate, and until they stop acting as if public input is something that can be bullied out of the way or papered over with slick ad and social media campaigns, they will continue to lurch about our schools, running into growing opposition to their priorities. The University of the State of New York (USNY) has a new Commissioner of Education. By a unanimous vote, the Board of Regents selected MaryEllen Elia, the recently fired superintendent of Hillsborough County, Florida, to head the New York State Education Department (NYSED) and serve as President of USNY which, in addition to overseeing the entire public K-12 education system of 7000 schools, oversees more than 240 public and private universities, 7000 libraries, the state archives, special schools for the hearing and visually impaired, over 750,000 licensed professionals, and over 200,000 certified public school teachers. She replaces former Commissioner, John King, Jr., and unlike her predecessor, she brings significant experience with public education, including a decade leading the 8th largest school district in the country where she was awarded 2015 Superintendent of the Year for Florida just a few weeks before a series of conflicts with the school boiled over in her early dismissal. Under her leadership, her district was given a $100 million grant from the Bill and Melinda Gates Foundation to tie teacher evaluation and compensation to student performance. While the grant program includes mentoring, principal evaluation, and peer evaluation, the district was also tasked to “develop fair and accurate measures of effective teaching” — for the Gates Foundation, this almost always means including at least some growth measures based upon student test scores. Whether or not she is genuinely capable of do so remains to be seen. Although she ran Hillsborough for an impressive ten years and was successful in securing the Gates Foundation grant, her removal represented long standing frustration with her leadership style which critics described as consistently uninterested in communicating with people she deemed as opponents. More pronounced criticism described a workforce under Ms. Elia that was “cowed” and afraid to speak up about concerns for fear of retaliation, and board members complained they often did not get information they needed from her — even when a 7 yearpold stopped breathing and later died during a school bus ride. Commissioner Elia had strong and loyal defenders as well, especially among the business community, but if her primary role coming back to New York is to lead a charm offensive that Dr. King was never able to do, watchdog organizations in the Empire State will need to keep a close eye on the substance behind the style. While our new Commissioner is preparing to go on a speaking and listening tour of the state, she would do well to try to understand exactly why New York is the current leader in the nationwide Opt Out movement against today’s standardized testing policies, having seen test refusals jump from nearly 60,000 in 2014 to 200,000 in 2015. In comments to the New York State Council of School Superintendents, Board of Regents Chancellor Dr. Merryl Tisch, lamented parents who opt their children out of standardized examinations, compared them to people refusing vaccination for their children, and pledged that “…we are going to continue to help students and parents understand that it is a terrible mistake to refuse the right to know.” In April, Chancellor Tisch insinuated that the growth of the opt out movement was the fault of the dispute between New York Governor Andrew Cuomo and the state teachers’ union, making roughly 200,000 families pawns in a labor dispute. So let’s just say that if Commissioner Elia is going to travel the state to understand the concerns of families and teachers, she needs to genuinely listen because NYSED has had cotton stuffed in its ears for some time now. The first thing she needs to understand is that simply explaining why we test as suggested by Dr. Tisch is not going to be sufficient. The still growing discontent in New York is not simply because nobody has bothered to explain the vision behind education policy in the state – to the degree that such a vision exists. The reality that nobody at NYSED appears willing to examine is that parents understand that there are very real and actually tangible costs to making standardized testing as high stakes as it has become in the No Child Left Behind era, and, worse, they are increasingly aware that those policies do not work and should be set aside. What has happened in the past decade and a half is a classic example of ever increasing perverse incentives that have taken standardized tests and converted them from an occasional check on the system into an increasingly important end unto themselves by which entire schools and individual teachers’ lives depend. Since little has been done concurrent with high stakes accountability to actually support and improve schools with resources and innovative services, the result has been a policy environment where the tests have consumed more and more of the curriculum. If you do not understand that parents are increasingly fed up with these phenomena and if you do not have a reasonable set of answers for them, then it is not likely that they will be swayed by mere explanations of why NYSED does what it does. Parents want change, not platitudes. It is unclear to me if Ms. Elias is suited for that task. While New York’s new commissioner is clearly far more experienced and far more understanding of how education consists of intersecting and overlapping stakeholders that policy must consider, her record is no less devoted to the core elements of “reform” — Common Core Standards, standardized testing, use of testing to rank and sort schools and teachers — than her predecessor’s or her new Chancellor’s. In the application for the $100 million grant from the Bill and Melinda Gates Foundation, Hillsborough predicted they would fire at least 5% of the districts tenured teachers for “poor performance,” and the grant work led her to develop, with collaboration from the teachers’ union, an evaluation system that uses test scores for 40% of teachers’ ratings. All but guaranteeing the percentage of teachers you will fire in an application to revamp your teacher evaluation and reward system should raise any serious thinker’s eyebrows. It smacks of the kind of stack ranking of employees that, ironically, the Gates founded Microsoft finally ditched after a disastrous decade of evaluating employees that way destroyed effective collaboration. If the Hillsborough application was taken seriously in the early years, teachers with low growth scores had to be constantly concerned if they would hit that bottom 5% in combination with other measures and be in danger of losing their jobs. While not as daft as the Microsoft system that required every employee in every unit to be placed on a normal curve, the five percent prediction amounted to over 420 teachers a year. As it turns out, the district came nowhere near that number by 2012, but it did manage to make a significant number of employees jittery. The destructive nature of including standardized testing data in teacher evaluation is discussed above. It narrows the curriculum. It incentivizes schools and teachers to make the test itself the curriculum. It consumes instructional time and resources that could be better used. It focuses learning on the least interesting skills and diminishes actual love of learning. It serves as a disincentive for both teachers and students to take risks that might diminish test scores. But there is an even more important reason to reduce the role of standardized testing data in teacher evaluation. Maybe one could have pretended otherwise in 2009-2010, but this should not even be controversial anymore. Growth models for teacher evaluation based upon standardized testing data do not work. In order for a growth measure to work, it has to be be able to peel away every factor that accounts for the differences among student test scores that is not attributable to the teacher, and we simply do not have statistical models that do this reliably. Commonly used models have standard errors as high as 36% for a single year of data, and they would require a decade of data to reduce the likelihood of mislabeling a teacher to 12%. Growth models are unstable, and ones that tend to produce stable results tend to be poorly designed. The models have a strange ability to label even teachers who are locally known to be excellent working with advanced students as ineffective because of how little room there is for students to not hit the model’s predicted scores. No wonder then that the American Statistical Association released a statement in 2014 saying that Value Added Models should not be use for teacher evaluation. Yet here we are in 2015 with Governor Cuomo having successfully browbeaten the state Assembly and Senate into passing a budget that makes value added measures based on test scores effectively half of the evaluation system for teachers, and with a new Commissioner who is pondering what percentage is “correct” for such measures. This all but guarantees that the tests will continue to have both a disruptive and distorting effect on schools and classrooms, threatening teachers who are good at what they do and diminishing the depth and breadth of the curriculum students experience. It also means that the reasons for the Opt Out movement to both exist and grow remain firmly in place. Education reformers today seem to treat any resistance to their favored policies as simple matters of marketing — throw a lot of money at consistent messaging and people will come around to realize that they actually love what you are selling. That approach can work in the world of innovative technology where people need to learn how it can change their daily lives. Education reform is not like that, however. First, we are pretty familiar with how standardized testing is overwhelming education as we well into the second decade of test based accountability. Second, people do not favor using those tests to evaluate teachers; while over 60% strongly agree that evaluation should help remove ineffective teachers, 61% oppose using tests scores to do that, up from 47% in 2012. Third, in the same PDK/Gallup Poll, parents with children in school reported something they have consistently said over decades: they like the schools their children attend. For 30 years, the percentage of parents giving their children’s schools grades of A or B has hovered near or above 70%. It has dipped lately, but that is as likely connected to the disruptive impacts of Common Core and associated testing as it is connected to parents agreeing with reformers. So reformers may want to believe they need to sell families on a new iPhone. In reality, they are peddling New Coke: messing fundamentally with something people like without giving them a substantial benefit in return. This is the challenge Commissioner Elia faces as she considers how to mount a defense of New York state policy to an increasingly restive population. If she continues to try to convince parents that they really love the taste of New Coke instead of laying the groundwork for the NYSED to walk back its disastrous policies, this will not go well. Look, we’ve had more than a decade of standardized testing now, and maybe it is time to put the test to the test. The original goal was to narrow the achievement gap and to boost our scores relative to the rest of the world. Well, a 2013 study found no support for the idea that No Child Left Behind has narrowed the achievement gap, and our schools on the international tests have not only failed to rise, they’re slightly down. And I do not want to hear what that French kid thinks of those results: Oh, all this time and all this money and your Race to the Top has been, how you say, a meandering jog on a treadmill. All of this for a little of what both Presidents asked for when selling their reforms…Right, so let’s look at that: because as far as I can see, this is a system that has enriched multiple companies and which pays and fires teachers with a cattle birthing formula, confuses children with talking pineapples, and has the same kinds of rules for transparency that Brad Pitt had for Fight Club. So for Pearson, the other companies, and all the lawmakers who have supported this system, the true test is going to be either convincing everyone that it works or accepting it doesn’t work and fixing it. Because at the risk of sounding like a standardized test scorer, your numbers are not good. And if it seems unfair to have your fates riding on a complicated metric that failed to take institutional factors into account and might not even tell the whole story, well, you’re not wrong about that but YOU do not get to complain about it. Of course, the stated purpose of The Education Post is create a “better conversation,” so given that John Oliver had ripped a sizable, factually accurate, hole in one of education reform’s most important tools — mass, annual testing — how did Peter Cunningham contribute to “a better conversation”? He called Mr. Oliver’s piece “tedious” and accused him of “throwing poor children under the bus” — because in reform circles, it is a matter of faith that only testing every child every year will force schools to close the achievement gap even though, as Mr. Oliver noted, there is scant evidence that it is working out like that. While Mr. Cunningham was repeating a standard line in education reform about the moral imperative of standardized testing, his colleague, Valentina Korkes, took a more plaintive approach as a supposed fan of John Oliver’s whose heart was broken over his takedown of testing. Ms. Korkes’ piece also covered familiar ground. First, she chided John Oliver for not mentioning that the current strongest centers of test resistance are in communities that are wealthier than average and in the suburbs. She claimed that the proliferation of testing at all levels — which reformers are recently lining up to decry — has nothing to do with federal policy that only mandates 17 tests. And finally, she claims that No Child Left Behind has seen gains in the achievement gap on measures like the National Assessment of Educational Progress (NAEP), so John Oliver could not say the tests did nobody any good. What does Ms. Korkes leave out? First, while she is correct that test resistance numbers are greatest in wealthier communities, there is the inconvenient fact that toeholds are showing up in the communities she and her fellow testing advocates claim to support, and there is no reason to discount the likelihood that these will grow in following years as the compelling reasons for them to do so are rooted in history and research. Similarly, while there have been very slight gains in NAEP scores during the life of NCLB, these are dwarfed by the gains that were made when federal policy in the 1970s and early 1980s was focused on equity and integration. In fact, Ms. Korkes’ affinity for the current testing regime in our schools is indicative of a chain of thought that is pretty well discredited by now. Reformers claim over and over that without annual testing of all children then we will never know how individual children are doing and we will hide achievement gaps from the public as schools are alleged to have done prior to NCLB. However, Dr. Bruce Baker of Rutgers University lays out pretty clearly that we have much more promising tools for ongoing formative assessment of individual students, and we have far less disruptive means of doing meaningful assessment of the entire system that do not require all children to be tested each year. Further, Dr. Julian Vazquez Heilig of California State University, Sacramento, has laid out a compelling vision of accountability for education that uses data as one of its tools but which is community based and sensitive to locally understood needs. It is simply a deliberate lack of imagination from reform advocates to profess that our current system is the only means we have available to improve education. The simple truth of our landscape today is that our testing system is far too disruptive, and it is tied to an accountability system that warps the high stakes examinations into goals unto themselves. Ms. Korkes, like many reform advocates, is mindful that testing has increased dramatically, but she is unwilling to entertain the role that reformers have had in bringing us to this point. She accuses John Oliver of misleading people on the state a federal policies related to testing by not emphasizing that of the 113 standardized tests taken by the average student by 12th grade, 96 of them are not mandated by the federal government. This is an accurate point, but it is also a point that involves significant sleight of hand, and an effort to race past the fact that it was the federal government which put such high stakes on standardized testing that states and localities followed suit to prepare their students for The Annual Big One. No Child Left Behind required that all schools in all districts in all states have 100% of their students testing as “proficient” in math and English in 2014, and NCLB required all schools to make annual yearly progress (AYP) in standardized test scores or face an increasing series of interventions leading to complete restructuring (often closing the school and turning it over to a charter operator). With such stakes attached the end of year tests mandated by NCLB, it is beyond disingenuous for testing advocates to wash their hands of states and districts requiring additional tests to benchmark students throughout the year. While the Obama administration promised to curb the growth of testing through NCLB, their key initiatives have made matters even worse. States may have gotten waivers from the most unrealistic expectations of 100% proficiency and AYP, but to get those waivers they had to agree to make testing a significant portion of teachers’ evaluations and to evaluate all teachers in all grades using data. Since the federally mandated tests are only in English and mathematics, this requires the use of more tests — or states can find themselves subjected to the original provisions of NCLB. So let’s be clear about the chain of cause and effect here: The federal government mandated both unrealistic goals and harsh consequences based upon student scores on standardized tests, resulting in states and districts adopting more benchmarking assessments so they were not taken by surprise with the federally mandated assessments. A new administration enters and “relieves” schools from some of those provisions, but only if states and districts agree to use data for evaluation of all teachers and the most common means of using data is value added modeling, which is shockingly unreliable but mandated anyway. This moves the dire consequences of students not doing well on the examinations directly on to the shoulders of individual teachers who are not only faced with increasing time spent testing, but also who are faced with powerful incentives to narrow their curriculum into direct test preparation. However, many have expressed concern about low-quality and redundant tests. And in some places, tests — and preparation for them — dominate the calendar and culture of schools, causing undue stress. Policymakers at every level bear responsibility here — and that includes me and my department. We will support state and district leaders in taking on this issue and provide technical assistance to those who seek it. Has such assistance come in the form of revisiting federal policy to decouple twisted incentives from monitoring education? Has such assistance come in the form of listening to what research says about value added modeling and dropping it as a favored policy? Has such assistance come as recognition that growth and support is a more viable policy for struggling schools than test and punish? Has such assistance come even in the form of an apology from Secretary Duncan and other testing advocates for having made testing so dominant that we have lost any focus on how lack of equity in education rests with policymakers trying to make school their sole anti-poverty program?